So you have heard me whining a lot lately about trying to cook in this heat. To tell you the truth, half the time I don’t even want to eat in this heat! But drinking, that is a whole other story! We only keep water and milk in our house. No soda, no juice, none of that crap. If you are thirsty, you drink water…that’s our motto! But then I made it to the Clover Food Truck on MIT’s Food Truck Row. 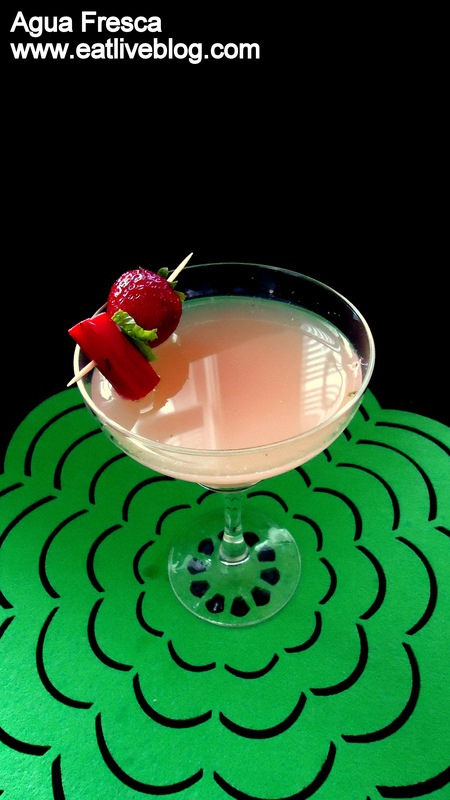 And there I had…Rhubarb Agua Fresca…a moment of silence please…. For some reason I cannot get this beverage out of my mind. The flavor isn’t strong, but it dances with your taste buds. I found myself taking a sip and then rolling it around on my tongue to get the full array of the flavor. And I did not stop thinking about it! Chef Rolando of Clover was nice enough to tweet me the recipe for my dream drink, and I was in heaven. Their traditional drink is straight rhubarb, water and simple syrup. I took some liberties with it, naturally! 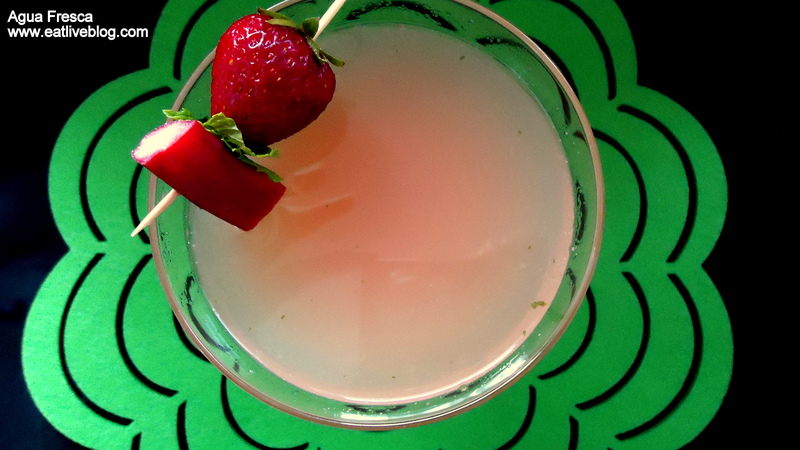 This is the perfect drink to sip pool-side, beach-side, or inside in the AC! Where ever you enjoy this, I promise this drink will make you smile! You may use an immersion blender, food processor or blender. Combine all ingredients except for the sweetener. Blend for 30 seconds, stir, and blend for an additional 30 seconds. Blend again if needed to get a smooth consistency. Place a metal strainer over a bowl and pour the mixture through the strainer. 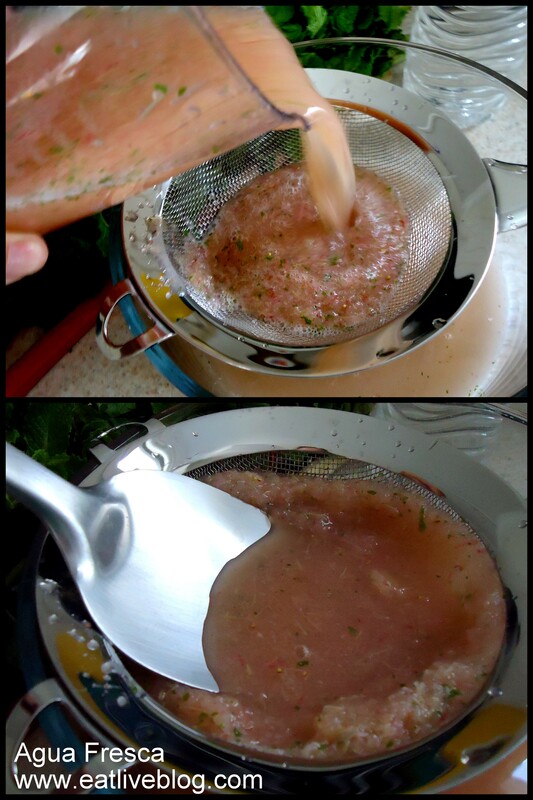 Use a metal spoon to press the remaining ingredients in the strainer until you extract all of the liquid. Discard ingredients remaining in the strainer. Add your sweetener (to taste) to the liquid. 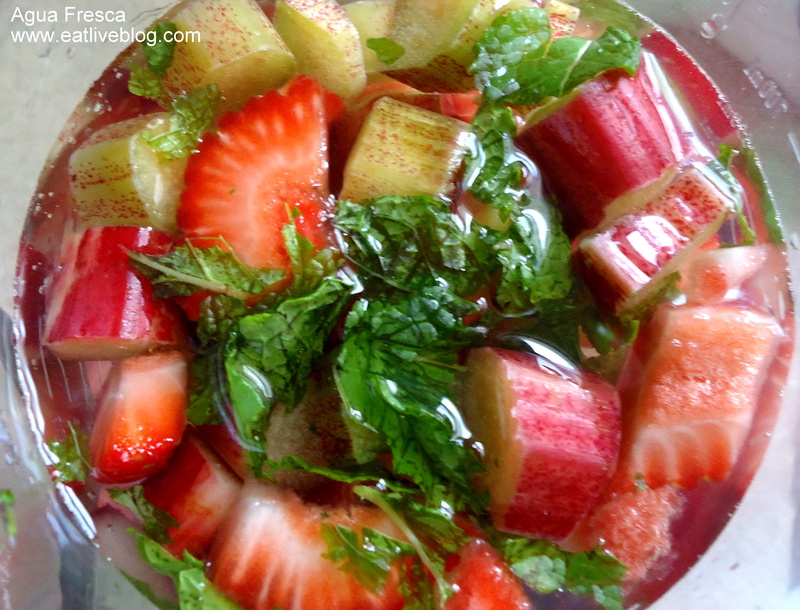 This entry was posted in Recipes and tagged agua fresca, clover food lab, drink, healthy, mint, recipe, rhubarb, snack, strawberry by reneeh. Bookmark the permalink. This is absolutely fabulous! Summertime requires more delicious beverages. It is an absolute must. I love your flavor combination. Refreshing! Thanks Candace! I know, Agua Fresca is “hot” right now! I have wanted to make it for a while, but I have been scared of it. It could not have been easier! Mmm sounds so refreshing. 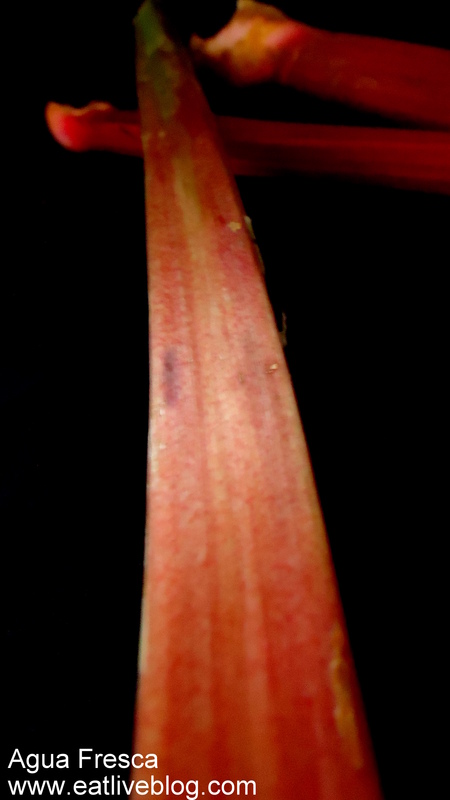 And you can never go wrong with strawberry rhubarb! Sounds Amazing.. if summer had a beverage it would be this! Sounds Amazing!! If Summer had a beverage it would this!! 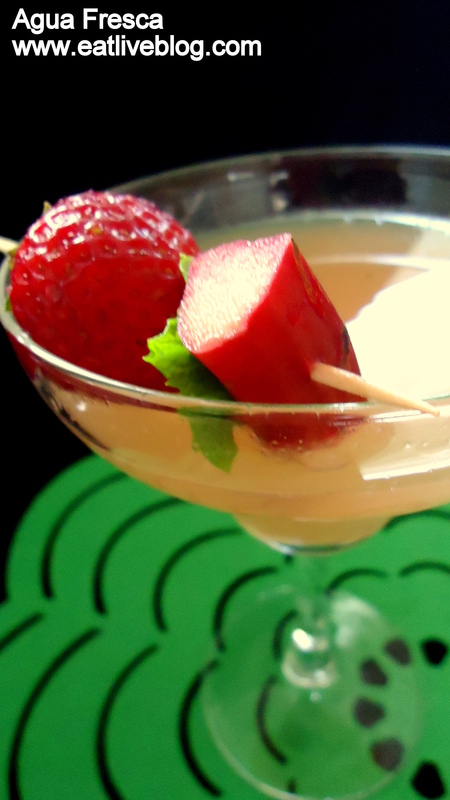 love the strawberry rhubarb combination in dessert form, pretty genius to turn it into a drink! nicely done. This sounds wonderful! I remember Flour was doing a strawberry-rhubarb soda at one point, and we all sampled it. So tasty!